Vital state-of-the art equipment to treat cardiac, stroke, trauma, maternity emergencies en route to regional or town hospitals, as well as standard emergency and paramedic diagnostic apparatus and ﬁrst aid supplies. Classroom furniture, special lighting, laboratory equipment, audio visual aids, textbooks and workbooks for up to 25 students per class. Classroom furniture, special lighting, mixed media supplies, specialty papers, easels, color printers, art and textbooks, audio visual aids, computers with internet access, software programs for graphics and design, etc. Qualiﬁed at-risk families are provided with one heifer (or other livestock) to help provide daily sustenance for the household and to generate additional income with dairy products sold at local markets. New kitchen appliances, canteen supplies and furniture. In some cases, bedding, handicap appliances, such as wheelchairs and walkers and other equipment. Basic school supplies for elementary and high school students, including writing instruments, art supplies, paper, notebooks, dry boards and markers, audio-visual aids and other essentials. This recently established scholarship is awarded to academically gifted and financially deserving students currently enrolled in college level engineering/technical programs. 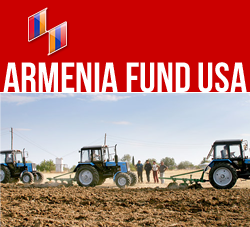 Recipients are selected by a special committee appointed by Hayastan All-Armenia Fund. Tuition covers all expenses associated with one year of coursework. Equipment for Basketball, Volleyball, Soccer*, Wrestling, Table Tennis, Calisthenics. Includes parallel bars, seating for spectator events, lockers and athletic uniforms for village teams. Qualiﬁed Armenian physicians specializing in neurosurgery, emergency medicine and other critical ﬁelds receive western best practices training at teaching hospitals in the U.S. In addition to facilitating placements and home stays near the hospital, travel and other miscellaneous expenses are covered.